What is currently going on in gold and silver is nothing short of a concerted effort to crush PM advocates. It is a measure of how desperate the central banking cabal has become. In our last Commentary, we stated that central planners/bankers would stop at nothing to further their evil ends: the confiscation of wealth, by whatever means, and the destruction of the middle class, as the bankers are moving, stumbling toward their vaunted New World Order. "If you can keep your head when all around you are losing theirs... If you can trust yourself when all men doubt..." ~ Edited from Rudyard Kipling's "If"
Everyone personally holding physical gold and silver, as we have been recommending, has no margin call to meet and no reason to sell. This is a temporary situation, and it will pass. Now is not the time to panic, for that is the intent of forcing gold and silver through strong support levels. Stay the course. To the extent you can, continue buying the physical metal. The PM ransacking is proof of how fearful central bankers are. It is the wooden stake into their financial main artery, for surely they have no heart. Nothing has changed that would warrant this level of sell-off, and if there is anything to be learned from this banker raid, it is what we stated above, "they will stop at nothing to continue their fraud. Nothing." What central bankers are doing is beyond even what we imagined. Bankers are in a state of panic. There is NO stability in anything they do, and they are circling the wagons. It is them against us. Do you see a single government coming to the aid/rescue of the people? No. Governments are the tail of the central banker dog when most people think it is the other way around. This is a message that should be sinking in for more and more people who still believe in a benevolent government. All governments have devolved into wealth-stripping. The EU is going after bank deposits, and now Germany is talking about a wealth tax on all property, stocks, bonds. In the United States, people's wealth has and continues to be "confiscated" via the invisible inflation tax. For those who choose to remain in the banking system, it is your choice. That clock is ticking. Cyprus was the alarm. You are on your own out there. Stay with what works, and do not let thieves steer you off a course that has a proven history of working. Buy silver, buy gold. The visual confiscation tax in the United States. 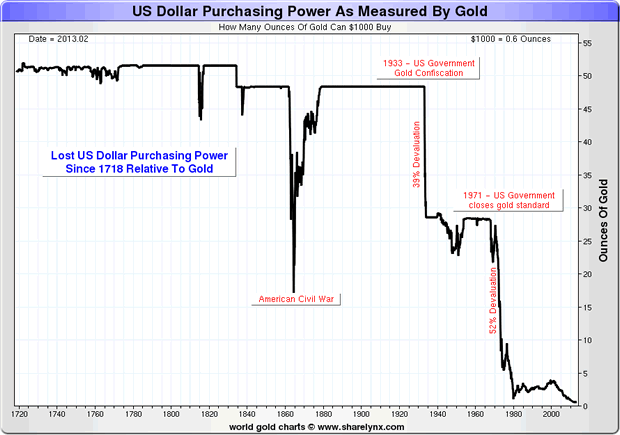 Is anyone still thinking of selling their gold or silver?